Those of us who are in love with Barcelona know all its corners, its squares, its streets, its historical monuments, places, museums …, which make the city one of the tourist epicenter in the world. But in this post we want to make special mention of the spaces that show spectacular panoramic views of Barcelona. We talked about the different viewpoints that the city has to know all its skylines and be expectant to the best postcards you can see. Located each in different areas, with different angles and different heights, it is an experience that surprises both locals and tourists. Are you ready to know the most outstanding? Despite being physically outside the urban area, it is one of the most famous structures in Barcelona. Built in the mountain of Collserola, the Telecommunications Tower designed by Norman Foster in 1992 for the Olympic Games, dominates the entire panorama of the city. As an architectural symbol, it remains one of the most representative modern monuments of the city. 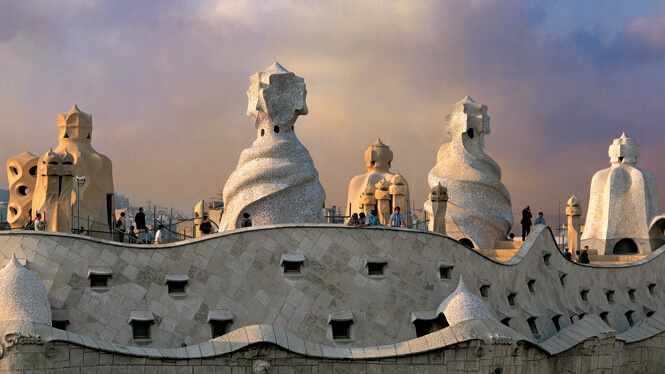 One of the most outstanding viewpoints of Barcelona with spectacular 360º views. Collserola tower is 288 meters high, a height enough to feel that you have the city of Barcelona at your feet. Another viewpoint of Barcelona that we can not miss is that of Turó de les tres creus, located in the highest part of Park Güell. Thanks its location in high levels of the city, from the viewpoint we can appreciate magnificent views. 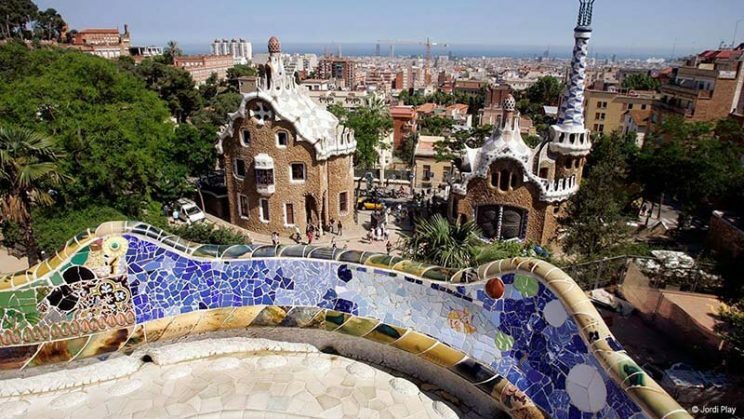 Park Güell is a beautiful construction by Gaudí that invites to walk and where visitors marvel at the incredible view of the city, which is why it is considered one of the best places in Barcelona. The Bunkers of Carmel are located in the Turó de la Rovira and can be accessed through the Guinardó Park. Given its strategic location, anti-aircraft batteries were installed on this hill that were in operation during the Spanish Civil War. 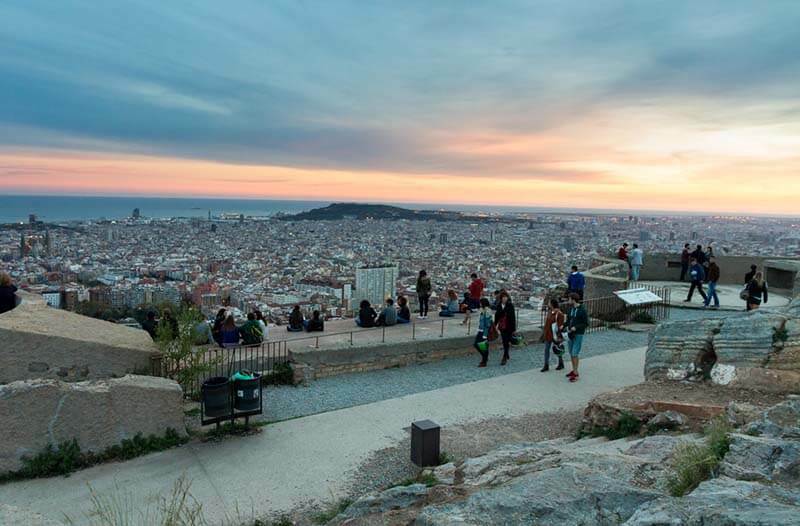 The views of Barcelona from the Bunkers of Carmel, are perfect for couples, to spend a sunrise or sunset of the most romantic in the heights of Barcelona. Of course, the area and the views are also nice to have a picnic with friends or family, or even to meditate in a quiet environment. 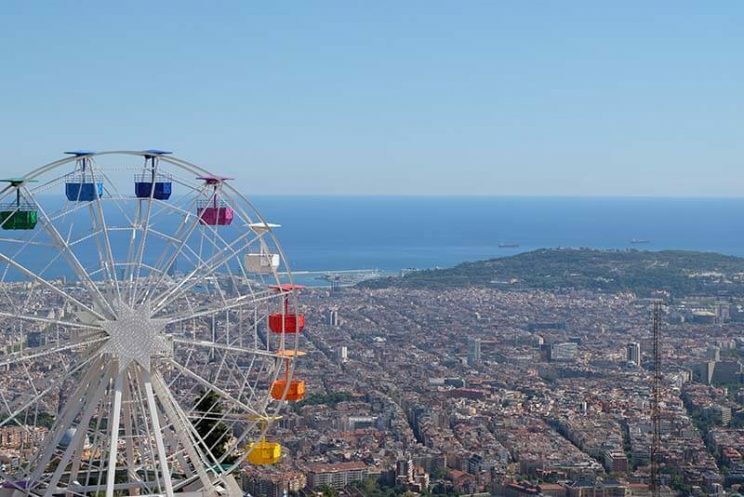 The Tibidabo viewpoint is on the highest peak of the Sierra de Collserola. Is one of the most visited places by tourists. 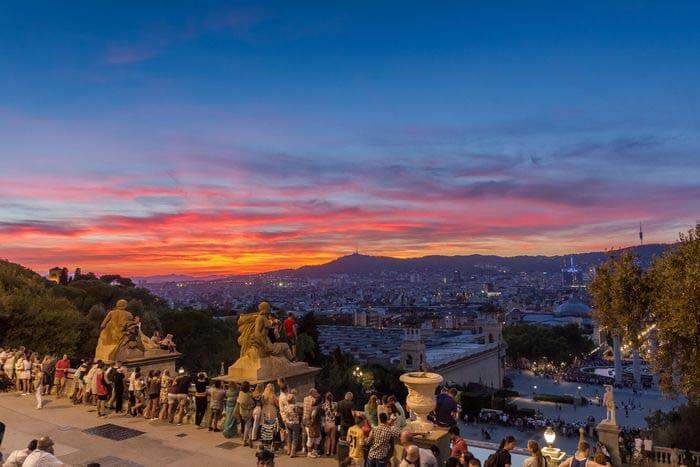 This beautiful viewpoint is also known as the Magic Mountain and there we can enjoy the oldest Amusement Park in Spain and the entire skyline of Barcelona. Its access is free and offers the possibility of entering the Templo Expiatorio del Sagrado Corazón, the same building that every night stands out for its enormous brightness from almost anywhere in Barcelona. From the Torre de Collserola, the Fabra Astronomical Observatory (a historic building that curiously is the oldest observatory in the world that remains in operation) and the Templo del Sagrado Corazón, which are located near the Tibidabo viewpoint, are also excellent places to take pics in Barcelona. 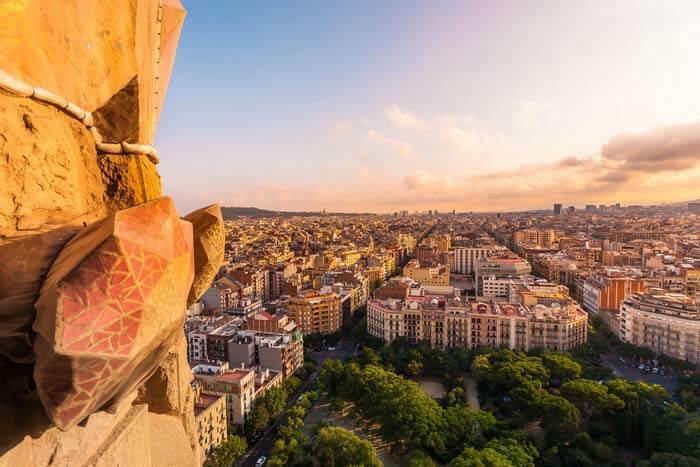 One of the most iconic and representative symbols of Barcelona, if not the most, has a fantastic viewpoint with stunning views. The Sagrada Familia, a symbol of modernist architecture created by Gaudí, attracts a large number of tourists who will fall in love with Barcelona when they climb their towers. Once completed, it is calculated on the year 2026, the main tower will measure 170 meters and will be the highest point of all Barcelona, but at the moment you can go up in the existing towers and walk through a catwalk that offers perspective to many monuments and most known buildings in the city. The National Museum of Art of Catalonia (MNAC) has two terraces-viewpoint located on the roof of the National Palace building. 360º views with free access for people who buy museum tickets. The MNAC, was built as the National Palace of Montjuïc, for the Barcelona International Exhibition of 1929. The museum have a collection of Romanesque art considered one of the best in the world. A must. Antoni Gaudí’s modernist work par excellence, one of the symbols of Barcelona, has a spectacular terrace from which to enjoy a different point of view of the Eixample district. In addition to being oriented towards Paseo de Gracia, it has strategically designed lookouts towards other points of Barcelona. One of the last viewpoints that were incorporated into the city. The old bullring of Plaza España was converted into a new shopping center a few years ago. On the top floor is where we find the viewpoint. 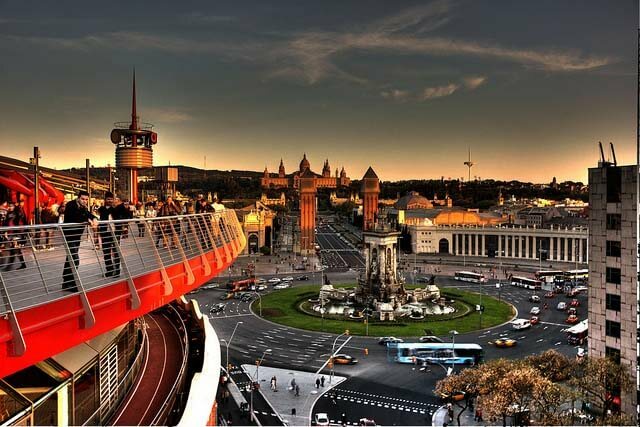 Las Arenas de Barcelona, has the perfect combination of leisure, gastronomy and a 360º viewpoint. The terrace, which can be turned around and enjoy a spectacular panoramic view of the city, is open every day throughout the day and is free, except if you want to access it by the external tourist lift of the building. The castle of Montjuïc, a legendary fortress located in what is probably the most strategic point of the city, is located at the top of the mountain of Montjuïc. Reopened to the public in 2008, the castle has become one of the points in the city to escape to enjoy its views. The views allow to discover another point of view of the city and also of the port of Barcelona, which is at the foot of the castle. You can climb the mountain of Montjuic by cable car, a small but spectacular viewpoint that offers us very unique views of Barcelona. The area was the center of the 1992 Olympic Games, where the Olympic Ring of Montjuic was built, where the Olympic Stadium, the Palau Sant Jordi and the Calatrava Tower are located. 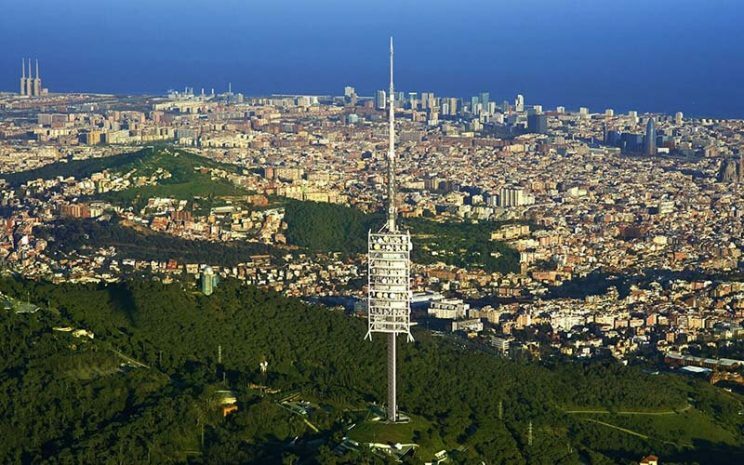 This viewpoint already exists, but the city of Barcelona has proposed to enable it for this purpose and plans to inaugurate it this year 2018. This new viewpoint is located in the Mercè de Pedralbes neighborhood, in the Collserola park, next to the Finestrelles water reservoir. The Finestrelles viewpoint will join the more than 20 viewpoints that already exist and will give us a new postcard of the city. 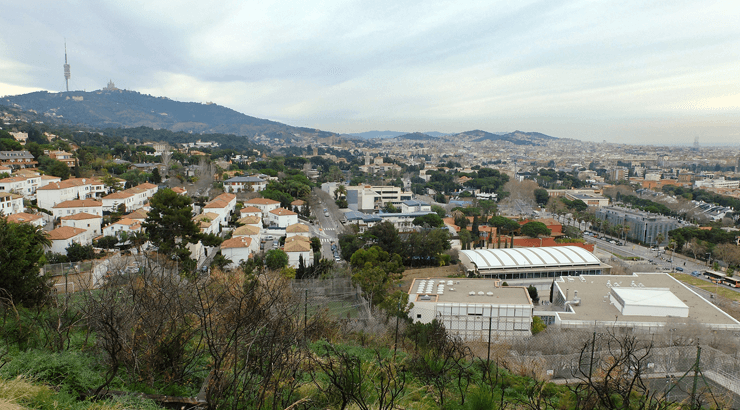 Views of the mountain of Montjuïc, the Olympic area, the Camp Nou, the neighborhood of Les Corts, the new area of Diagonal Mar and even El Prat airport, can be seen among the most symbolic monuments and buildings of the city.